As promised, here’s a homemade biscuit recipe to use with the Gimme Lean vegan sausage. Of course they can also be used with real meat sausage, jelly, butter or anything else people traditionally use biscuits for. In a large bowl, whisk together the flour, baking powder, baking soda and salt. Cut in the shortening until the mixture appears evenly lumpy. Gradually stir in milk to form a ball. Place the now very sticky dough on a floured surface. Dust with flour as needed to decrease stickiness. Flatten the dough and fold over on itself 15 to 20 times. Finally, flatten the dough until about 1 inch thick. Cut biscuits out of the dough with a circular cutter (usually either about 2 or 3 inches round). 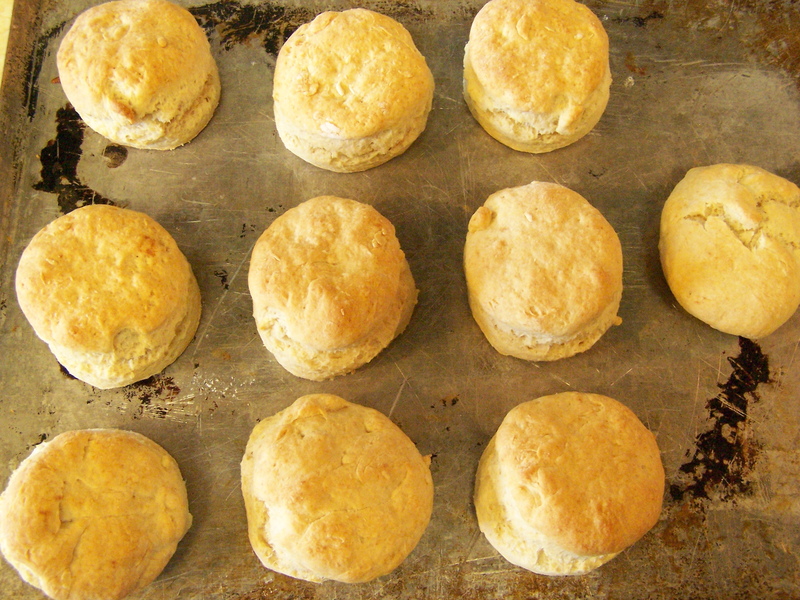 Pictured are 2+ inch biscuits. Gather the unused dough, form back into a ball, flatten and continue cutting biscuits. Place the cut biscuits on an ungreased baking sheet. The ingredients here make about 13 – 2 inch biscuits. Truthfully, I like Hardee’s biscuits better. Even McDonald’s. These came out a little “dry” in the sense they were too crumbly. Perhaps I over baked or measured too little shortening or didn’t fold over enough times or used a little too much baking soda. Whatever the reason, after making these, I realized a roll of pre-made refrigerator biscuits only costs about $1. Same for a small package of dry biscuit mix (only needs water). At least in this case, convenience may trump home cooking. I’ll be trying those two next. This entry was posted on 09/18/2011 at 21:37 and is filed under Recipes, Recipes, food, cooking and related items. You can follow any responses to this entry through the RSS 2.0 feed. You can leave a response, or trackback from your own site.